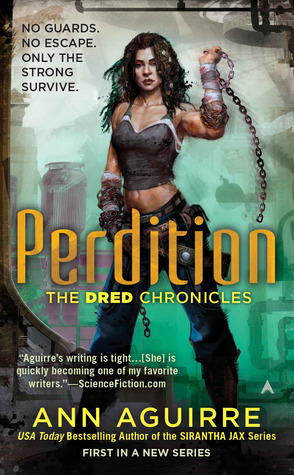 One of the books that we will be highlighting as part of our Sci Fi Romance month is PERDITION, which is the first book in Ann Aguirre’s spin-off trilogy from her GRIMSPACE series. While the original series focused on the universe at large and the politics and intrigues and aftermath of galaxy wide war, PERDITION is solely set on a former mining outpost turned prison ship which orbits an asteroid. The spin-off character Jael, who appeared in the GRIMSPACE series, was last seen being imprisoned in Ithiss-Tor, due to his betrayal to Jax and her friends, and is now being shipped to Perdition. This is a place where the worst criminals are locked up because they are so dangerous that even the Conglomerate authority couldn’t control or want to hold. And unlike their other prisons, Perdition is a prison which doesn’t have any guards and is split into six different factions and controlled mostly by psychopathic criminals. However, there is one faction which is run by the Dread Queen, called Queensland, which Jael is persuaded to join although there was not much choice since the other territories are hellish. But Jael is soon caught up in a war for resources for the crumbling prison that tests his resolve not to trust those he has allied with. Let me just say I didn’t think Ann Aguirre could top the GRIMSPACE series but she definitely did with PERDITION. This had a different feel and tone, and it was a huge departure to the previous series. I loved the stark, oppressive and tense overtones which had the protagonists struggling to survive as well as dealing with opposing dangerous gangs. I was really impressed with the heroine, Dred, who became queen of her territory by an accident of events and her journey to leading a territory full of violent murderers, rapists and worse, was fantastic to see play out. I loved her intelligence and the iconic imagery of her fighting with chains whipping out like lashing snakes was vivid and added a breathtaking element in the action scenes, which was pacey and tense. I was also glad to see Jael reappear in this series because he was an intriguing character and he really comes to his own in this book, I loved the insights to his character which helps to explain why he betrayed his former crew. His relationships with the prisoners, most notably with Dred was also great to see develop, especially with the romantic facets that is subtle which builds up in the book. It also helped to highlight how he struggled from being so closed off, wary and suspicious to wanting to be a part of what Dred has created from the chaos and mayhem of the previous tenureship of the last King. I think the themes of the book were thought-provoking and gripping because it really explores the nature of what it is to be human in a place like Perdition, but also the nature of good and evil. It doesn’t take a moral view and there is a lot of grey and moral ambiguity. I found myself rooting for characters who I wouldn’t want to meet or like in the real world. I especially loved how Jael and Dred dealt with these theme because Jael distrusts everyone but learns to trust and actually starts wanting to be a part of the group he finds himself in. With Dred, her empathic psychic gift was an interesting aspect to her character which had damaged her psyche but she became a survivor, and Ann Aguirre has made her character so charismatic. She literally leaps off the pages, chains snapping. I also think the atmosphere reminded me of a crossover with an adult rated version of PIRATES OF THE CARIBBEAN and PRISON BREAK. I loved this mish-mash of elements and it really helped to create a vibrant but dark world. But overall, the fast hectic pace, the intrigue and the great characterization made this a breathless and amazing read. I was very sad that I had to turn the last page. Dred and her cohorts has firmly captured my heart! So I’m a huge fan of her Jax series…for some reason though I wanted to wait to see how this book held up. And I guess it does 😉 Must go grab it. Wonderful! I loved the Sirantha Jax books and didn’t realize she had another series coming out. I’m off to purchase. Thanks! So I bought this after reading your review and I LOVED IT!!! Easily one of the best books I have read all year. Thanks so much for posting, I had no idea she was starting a new series and now I’m dying for the next book.